If Your Harrow Doesn't Have These Qualities, You May Have The Wrong Harrow! Home/If Your Harrow Doesn’t Have These Qualities, You May Have The Wrong Harrow! Stays sharp longer. Sheds moist soil and trash because of four smooth sides. Reversible – for double wear. A harrow is only as strong as its teeth. The harrow’s strength is in the tooth. Harrow performance starts with a strong, dependable tooth. Our tooth gives you deep cultivation and level seed bed preparation at high speeds. Every tooth we make is built to meet exacting requirements. 1 5/8” or 1.9”O.D heavy duty tubing is larger and stronger than other makes. Made from high carbon steel to give you longer working life at high speeds. 1/2″ or 5/8” square harrow teeth are perfect self-cleaning squares, hammer forged of high carbon steel and guaranteed to outlast any other teeth of equal weight. You get superior penetration, lasting sharpness, double wear and economical single tooth replacement. The tooth is a perfect square with four 1/2″ or 5/8” sides to make it more durable, penetrating any type of soil. The tooth, with four smooth, flat sides, has no crevices or concave surfaces that may fill, clog or otherwise lessen its performance. The tooth’s square design makes it easily reversible for twice the wear, and easily replaceable, making the harrow like new again after years of use. With the open ends down, our drawhooks stay hooked even when trailed over the roughest terrain. 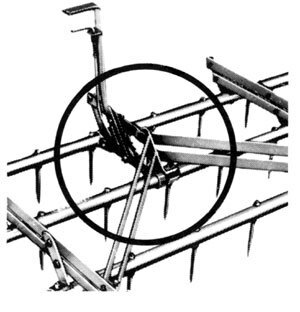 Their placement assures equal pulling tension on the drawbar and keeps the harrow down for deep soil penetration. 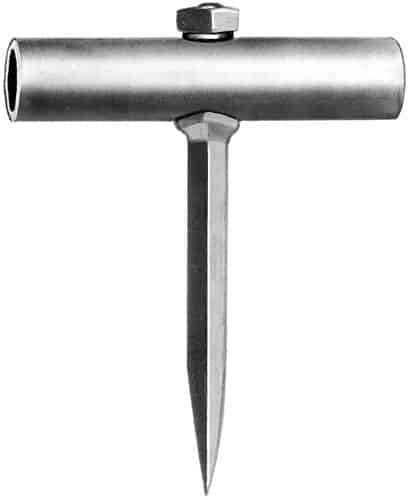 Exclusive, easy to handle lever, sets tooth angle quickly to fit crop or soil conditions. Trip spring lever allows fast resetting to any angle, even flat for easy transportation or storage. 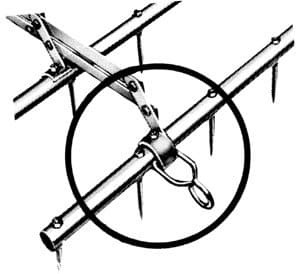 Links are one piece, double-strength, designed to resist jolts and severe tension. 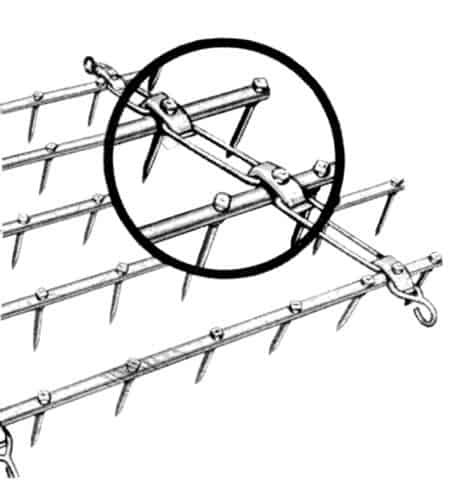 Double clamping eliminates side play and assures true trailing for maximum harrow effectiveness.